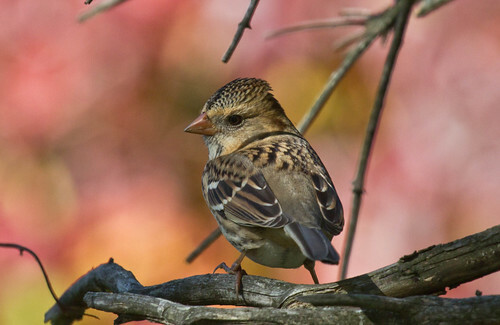 Most of my favorite sparrows belong to the genus Zonotrichia. This genus has five species, all fairly large birds with conspicuous markings. 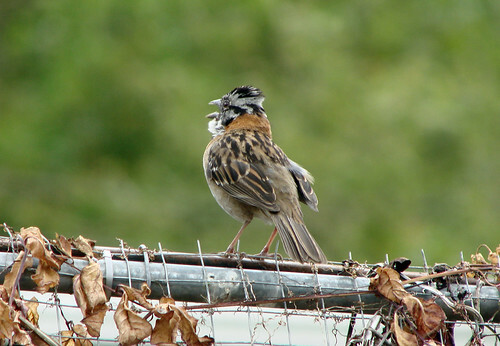 The Rufous-collared Sparrow is tropical. 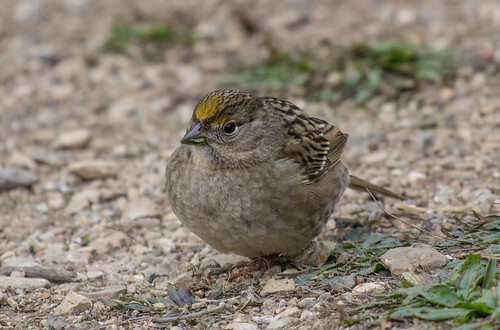 The Golden-crowned Sparrow breeds in the Northwest and winters along the Pacific slope from Canada to Baja California. 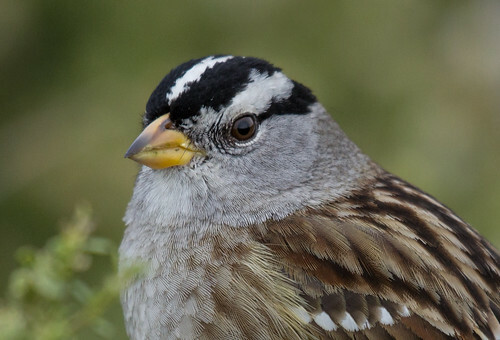 Eastern forms of the White-crowned Sparrow breed in northern Canada, and western forms from Alaska down through the mountains—they migrate through in the north woods, and once in a while an individual spends the winter at a feeding station. 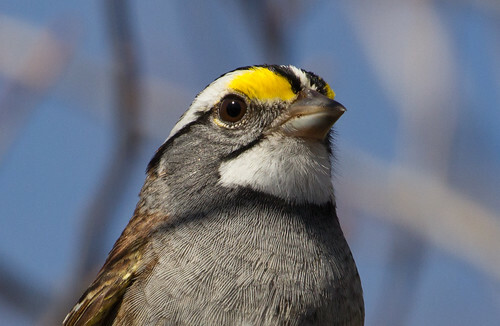 The White-throated Sparrow breeds in the north woods, is an abundant migrant visiting our feeders in huge numbers in spring and fall, and some winter here. 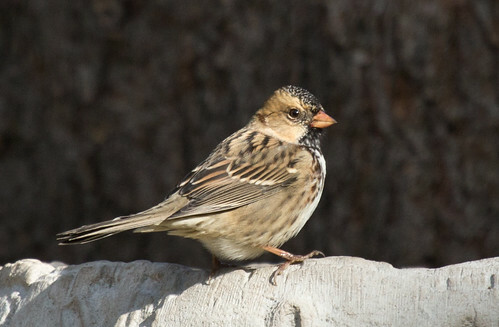 Harris’s Sparrow breeds in the transition zone between the subarctic boreal forest and the Low Arctic tundra of northern Canada. Some individuals stray into northeastern Minnesota and northwestern Wisconsin every migration, en route to their wintering grounds in the central states from South Dakota down through Texas and northeastern-most Mexico. This is the only species considered endemic to Canada, because it breeds nowhere else on the planet. We in the upper Midwest get to see only a handful of Harris’s Sparrows each year, and then only if we’re lucky. One or two turn up in my mother-in-law’s feeding station in Port Wing, Wisconsin, every May and September, and they usually turn up in my yard at the same time. They’re easy to pick out among the many White-throated Sparrows, but finding them requires that you actually look at each of those sparrows. I hear their song rarely in spring, and I’ve never heard them sing in fall. 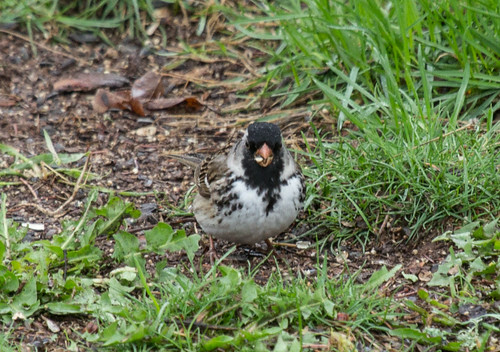 Like the White-throated Sparrow’s song, Harris’s Sparrow whistles and is easy to imitate. The notes are in a minor key, giving the song a mournful quality. Its call note is pretty similar to the White-throated Sparrow’s, but the quality is different enough that I learned to distinguish them without any trouble, but I did pay attention to both species to notice the quality differences. You can hear their songs, and the songs of just about every North American bird, at Cornell’s wonderful www.AllAboutBirds.org. As I knelt to examine the nest a thrill the like of which I had never felt before passed through me. And I talked aloud! "Here!" I said. "Here in this beautiful place!" At my fingertips lay treasures that were beyond price. Mine was Man's first glimpse of the eggs of the Harris's Sparrow, in the lovely bird's wilderness home. Sutton may have had the heart of a poet, but he had the instincts of a 19th Century ornithologist, so he immediately shot the mother and collected the nest and eggs. The bird itself had been “discovered” for science in 1834, when Thomas Nuttall found one in Jackson County, Missouri. Nuttall was a botanist who reportedly never carried a gun, but someone in his party did, and so Nuttall’s bird lies in a drawer in the Academy of Natural Sciences in Philadelphia, serving as the type specimen for the species. I wish they’d kept Nuttall’s name for the bird—he called it the Mourning Finch—but he also gave it the scientific name Zonotrichia querula, which is still its name. Querula is obviously related to “querulous,” which means argumentative, but at that time it also meant whining, fretful, or lamenting, Nuttall’s interpretation of the song. I know I’d be whining and fretful and lamenting if I were a bird in a world where the most powerful species held my life in so little regard. 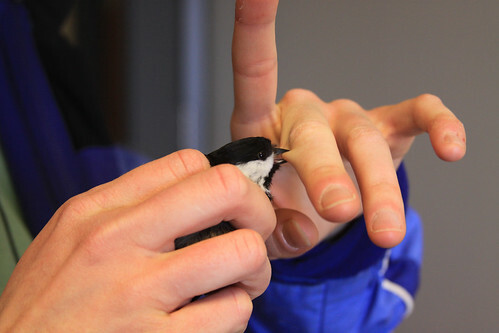 No wonder chickadees bite bird banders so viciously.